Lord Shiva and Parvati were playing a game, which Lord Shiva lost. He left Mount Kailasa in a huff and wandered from place to place until he reached Gomant. Parvati went in search of him till she reached Gomant. Lord Shiva assumed the form of a tiger to frighten Parvati. On seeing the tiger, Parvati cried out “Trahi Mam Girish” (Protect me, O Lord of the Mountain). In her fear, she ended up saying “Trahimangeesh”. Lord Shiva settled down in Kushasthal near the banks of river Aghanashini. The idol there thus was called Shri Mangueshi. 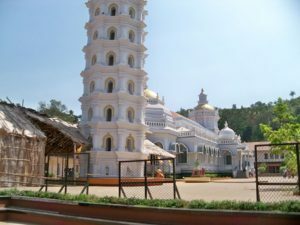 Kushasthali in Gomant then became Kutthali in Govapuri, and is currently known as Cortalim in Goa.